Saint Patrick himself would have to deal with pinching on his feast day. His color was “Saint Patrick’s blue,” a light shade. The color green only became associated with the big day after it was linked to the Irish independence movement in the late 18th century. Yeah, I really just wrote that! For most of the 20th century, Saint Patrick’s Day was considered a strictly religious holiday in Ireland, which meant that the nation’s pubs were closed for business on March 17. In 1970, the day was converted to a national holiday, and the stout resumed flowing. Through the Ice Age, Ireland was too cold to host any reptiles, and the surrounding seas have staved off serpentine invaders ever since. Modern scholars think the “snakes” Saint Patrick drove away were likely metaphorical. Don’t be fooled by any holiday decorations showing lady leprechauns. In traditional Irish folk tales, there are no female leprechauns, only nattily attired little guys. Far Rockaway does it again! Far Rockaway resident Davon Armstead is the second-high school athlete this year that obtained a full-ride scholarship to play college football on the big stage. Armstead, Rockaway Ravens, and Abraham Lincoln High School athlete visited 6 different schools. Schools including Stoney Brook, Rutgers, Temple, Southern Connecticut State, Assumption College, and Buffalo State. Buffalo State considered a Division 3 school by the National Collegiate Athletic Association (NCAA). However, Armstead stated very clearly why he made his decision to commit to Buffalo State over the other schools with Division 1 programs. Armstead kicked off his High School career at Grand Street Campus on their Junior Varsity team. During his first two years on the team, Armstead displayed his athleticism that left bystanders in awe. He recorded 22 catches for 444 yards and 6 touchdowns as a first-year student. Sophomore year, it gets even better. Armstead cashes in 21 catches for 500 yards and 9 touchdowns. With all that momentum leaving JV, Armstead was ready to move on to Varsity at Grand Street. Until unfortunate circumstances began to plague Armstead’s life. Armstead mentioned the issues surrounding a scandal that fired one of his head coaches at Grand Street. It was so bad that Public Schools Athletic League (PSAL) had to step in and punish the football program at Grand Street. Grand Street Campus fired controversial head coach Bruce Eugene for letting a Long Island football player use his Brooklyn address to enroll in the school. The Department of Education requires students who are not residents of New York City to pay $7,119 a year to attend public schools, according to some sources. Nonetheless, the school had to give up an entire season. As a result, Davon Armstead deadlocked to start his Junior year of football. That did not stop him at all! 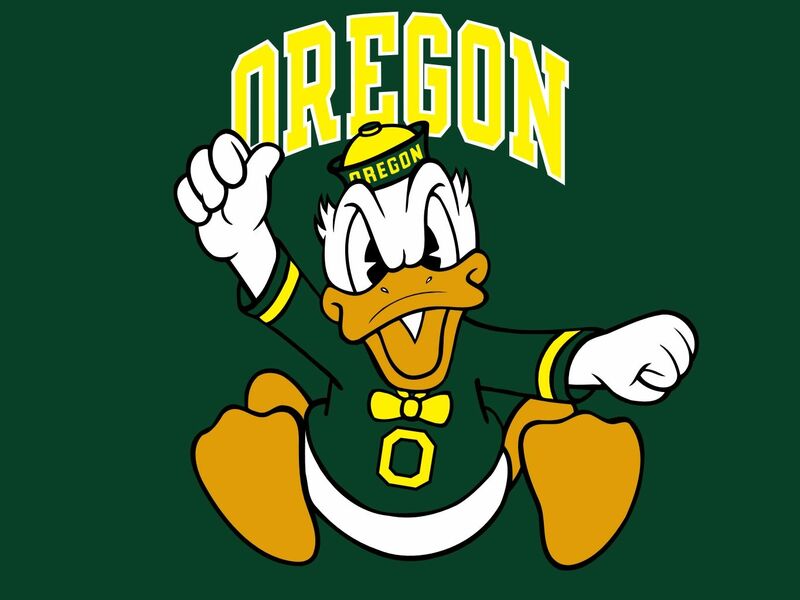 Armstead put in a transfer to Abraham Lincoln High School for another shot at continuing his football career. Armstead at Grand Street recorded 5 catches for 87 yards, only playing 3 games his junior season. If you think that was a bit much, Armstead’s toughest challenge was yet to come. Armstead was made aware during the offseason of his junior year that his little brother Jacob Armstead was diagnosed with stage 4 cancer. When I asked Armstead what advice you can give the others your age that is going through the same or worst, he gave resilient advice. Davon Armstead’s senior year was nothing more than incredible, including all he has been through to get to where he is at now. During his senior year, he recorded 16 catches for 267 yards and 1 touchdown. 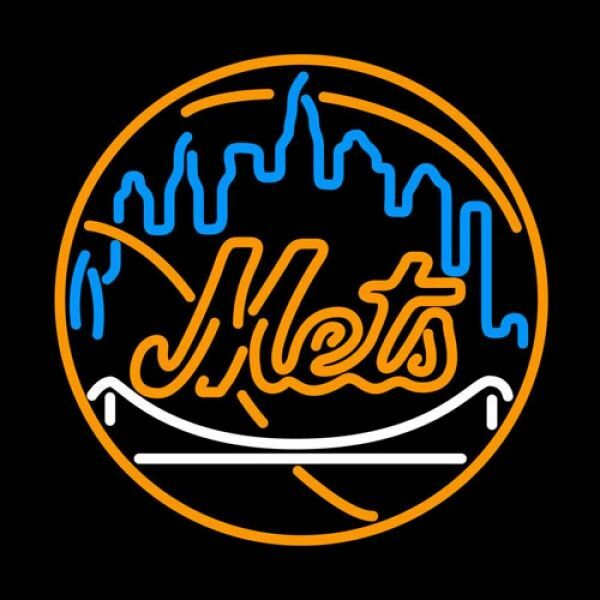 His team even made the semi-finals the same season of the 2018 PSAL Championship. The same year Rockaway’s own Christian Izien reached the championship at his school Erasmus Hall and is also on his way to college at Rutgers on a full-ride scholarship, despite the loss to Curtis High School. Davon Armstead is well on his way to the big stage. There is no question if he is ready or not. The hardships, dedication, and hard work, speaks for itself. The Rockaways is with you Davon, more importantly, your brother Jacob is here to witness your journey. View more of Davon Armstead highlights and photos down below. In response to our elected officials’ failure to address gun violence we, the students of the Far Rockaway Educational Campus have organized a local walkout in solidarity with the Women’s March EMPOWER to call for comprehensive gun violence prevention legislation. Far Rockaway, Queens, NY — March 14, 2018 marks one month since the shooting at Marjory Stoneman Douglas High School in Parkland, Florida, which left 14 students and 3 staff members killed and many others wounded or injured. We are calling for students, teachers, school administrators, parents and allies to take part in a #NationalSchoolWalkout for 17 minutes (in honor of the 17 lives taken in the tragedy in Parkland) at 10am across every time zone on March 14, 2018 to protest Congress’ inaction to do more than tweet thoughts and prayers in response to the gun violence plaguing our schools and neighborhoods. We, the students at the Far Rockaway Educational Campus, have decided that this moment is too crucial and this issue too urgent to stand idly by. We believe that if we remain silent we agree with what is going on in our schools and community. With the recent shootings in our community we feel we should not fear coming to school. We stand united to stand up against gun violence, both in and around our school. On March 14th at the sound of the class bell (9:52am) we will be walking out of our classes and safely to our football field. As we get to the field we will kneel in unity and have a moment of silence (at approximately 10 am) for those lost in our community and across the nation. A guest speaker will share a few words and then at 10:17am we will return to our classes. We are walking out for ALL people who have experienced gun violence, including systemic forms of gun violence that disproportionately impact teens in Black and Brown communities. It is important that when we refer to gun violence, we do not overlook the impact of police brutality and militarized policing, or see police in schools as a solution. We also recognize the United States has exported gun violence through imperialist foreign policy to destabilize other nations. We raise our voices for action against all these forms of gun violence. We students and our allies are organizing the school walkout to demand Congress pass legislation to protect us. WE ARE NOT SAFE at school. We are not safe in our cities and towns. We need action. It is our elected officials’ jobs to keep us safe and pass federal gun reform legislation that will address the public health crisis of gun violence. We want Congress to pay attention and take note: many of us will vote this November and many others will cast their ballots in 2020. Over 2,545 demonstrations have been registered across the nation! This our notice to you to join us! More than one hundred parents and students lined up to speak up about school closures in New York City at a meeting of the governing board for the New York City Department of Education. The meeting began at 6:30 p.m. Wednesday evening in Lower Manhattan. The closure of P.S./M.S. 42 and M.S. 53 in Far Rockaway was not approved. That measure was voted down by a vote of six to six with one abstention. 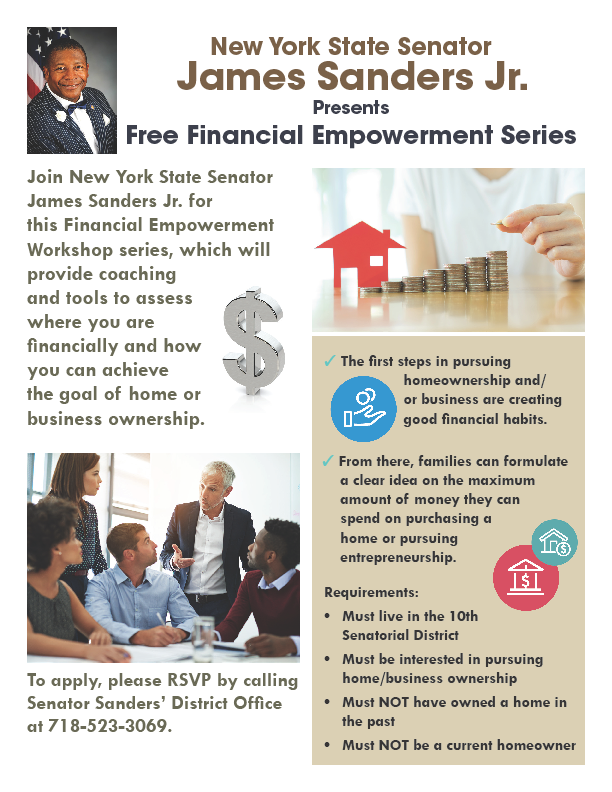 New York State Assemblywoman Pheffer-Amato and Councilman Donovan Richards stated the following. 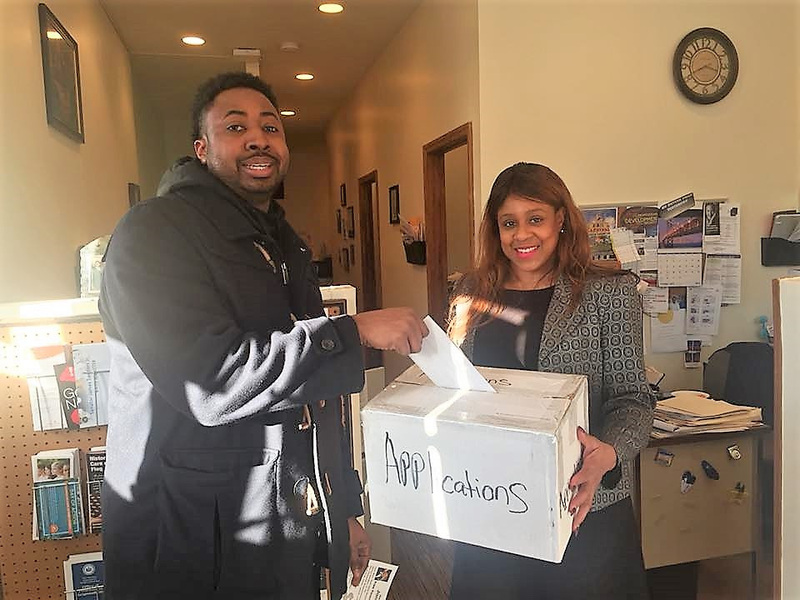 We are in the process of signing up residents for our Financial Bootcamp. You can own your own home or business! Sign up today. Call my office at 718-523-3069. 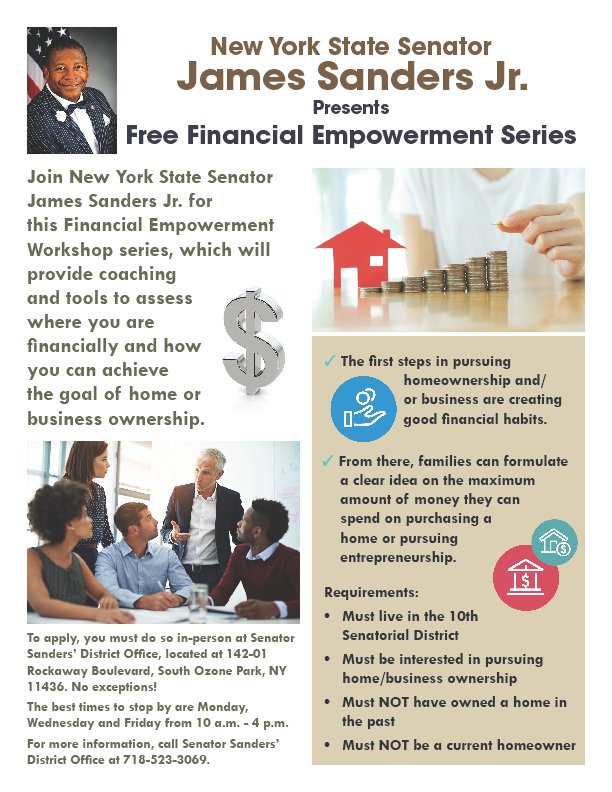 Kick your finances into gear with Senator Sanders’ FREE Financial Boot Camp. Do you want to own your own home or business but have bad credit or no credit? We can help. This once-in-a-lifetime program will give you all the tools you need to achieve your dream including learning how to repair or acquire credit, designing a budget and creating a plan for success – one that is specifically tailored to meet your needs with the help of expert one-on-one counseling. Classes will be held twice a week for four weeks. You must attend all sessions to successfully complete the training. If you are not sure if you live in Senator Sanders’ District, click the link below and enter your address to determine your state elected representative. Join us for an important community meeting and learn how you can benefit from the $10 billion investment in JFK. 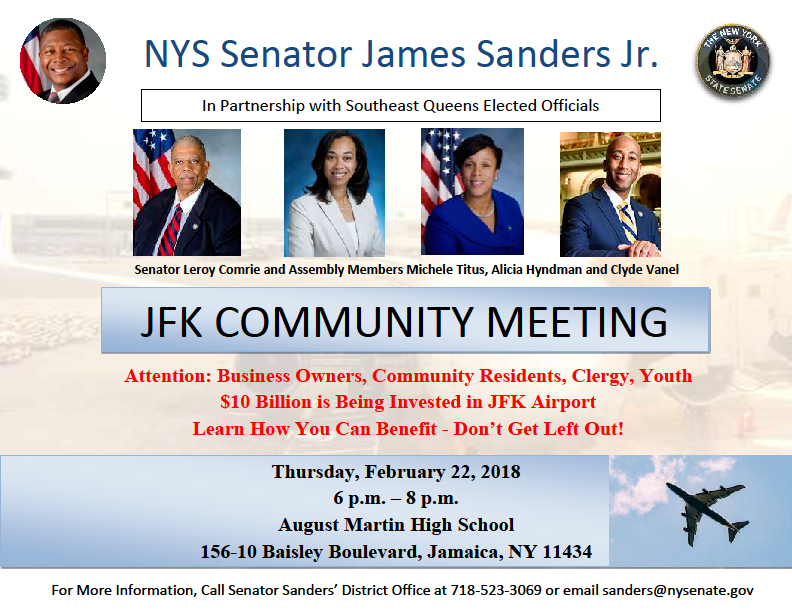 State Senator James Sanders Jr. (D-Rochdale Village, Far Rockaway) will host an important meeting to inform different members of the public how they can benefit from the $10 billion investment in JFK. The groups who will be specifically addressed are community residents, business owners, clergy and youth. Senator Sanders will be joined by Senator Leroy Comrie and Assembly Members Michele Titus, Alicia Hyndman and Clyde Vanel. The event will be held on Thursday, February 22, 2018 from 6 p.m. – 8 p.m.at August Martin High School, located at 156-10 Baisley Boulevard, Jamaica, NY 11434. JAMAICA, NY—This week, Congressman Gregory W. Meeks (NY-05) and Congresswomen Grace Meng (NY-06) of Queens were joined by staff of U.S. Reps. Carolyn Maloney (NY-12), Nydia Velazquez (NY-07), and Hakeem Jeffries (NY-08) in a meeting the Members requested with the United States Postal Service (USPS) about the ongoing postal crisis in Queens and Brooklyn. 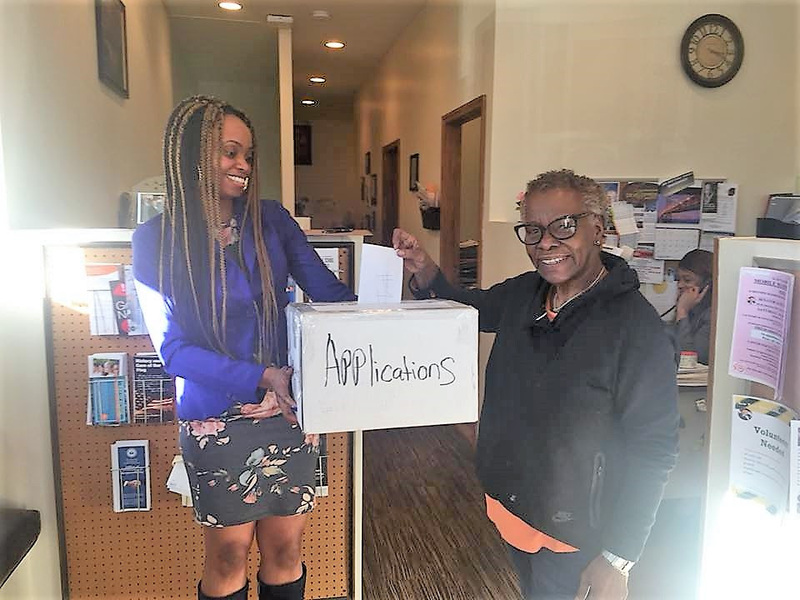 Stop by Senator Sanders’ District Office and fill out an application. This must be done in person. We are located at 142-01 Rockaway Boulevard, South Ozone Park, NY 11436. For more information, call Senator Sanders’ District Office at 718-523-3069. Assemblywoman Stacey Pheffer Amato announced today her NYS Assembly Session Intern, Michael Matteo, who will be working out of her Albany Legislative Office for the 2018 Session. Matteo, a Staten Island native, and senior at Baruch College majoring in Public Affairs with a minor in Law & Public Policy, started the Assembly Internship program with previous legislative experience. Matteo has aspirations to attend law school in the near future, and has an interest in sports and gambling law. Formerly, Matteo, was an intern for Councilman Donovan Richards in his Manhattan Legislative Office. Matteo has gained an impressive amount of aptitude and facility with the legislative process through his experience interning in the city council and currently is helping with bill research, drafting of memos and even coordinating Albany scheduling within the Assemblywoman’s Office.